I will choose the view of the lake from Raymer’s Cove. The birding in the parking lot area can be spectacular in migration. At any season (when the lake is open), you might see or hear a loon or see diving ducks or grebes during migration. The oak is wonderful and at certain seasons the wildflowers are outstanding. Raymer’s Cove has recently been renamed to recognize the long-ago gift of this parcel by George Raymer, a prominent local landowner and newspaper editor, who donated this land to the Madison Park and Pleasure Drive Association. You might try to imagine this lake overlook in the early 1900s, crowded with families arriving by horse and carriage for a Sunday afternoon picnic. Raymer’s Cove provides easy access to the shoreline from Lake Mendota Drive. Free short-term parking is available here for visitors who wish to take the new staircase down to the water’s edge. The sandstone cliffs where Raymer’s Ravine meets the lake are especially beautiful at sunset. From this spot you can hike the Lakeshore Path east through Tent Colony Woods toward Frautschi Point or west to Wally Bauman Woods and Eagle Heights Woods. 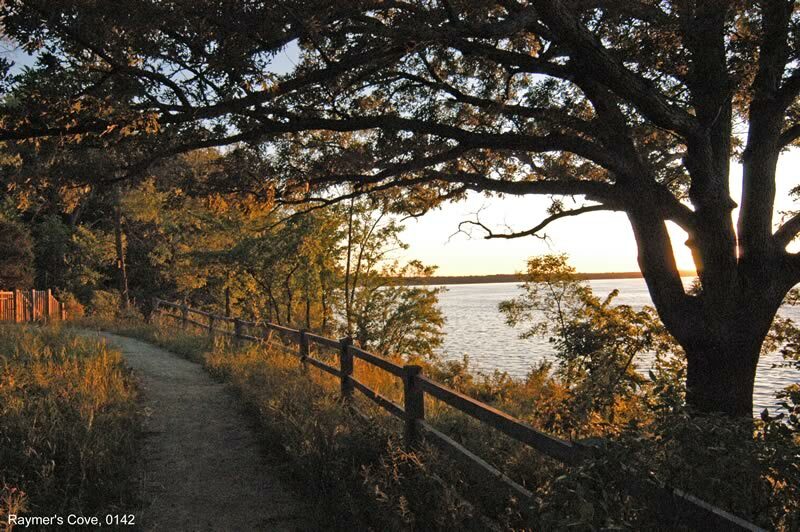 A 2003 Department of Natural Resources grant to reduce erosion and storm water runoff into Lake Mendota was obtained through matching resources from the State of Wisconsin in combination with a generous gift from the Friends of the Lakeshore Nature Preserve. Through their advocacy, financial support, and volunteer labor, the Friends continue to be leaders in promoting projects that infiltrate rain water where it falls to prevent it from becoming damaging runoff in fragile areas of the Preserve. Volunteers are restoring this lovely prairie area. This restoration effort will help protect a few rare prairie species on the sandstone cliffs above the lake that are not found anywhere elsewhere in the Preserve.